I have a lot of trouble with night sweats and I have been reading several posts on message boards by others who apparently are having the same problem. I have read that many ME/CFS patients are recommending something called a “Chillow Pillow”. You can find these on Amazon.com and you can follow THIS LINK to see and purchase one. 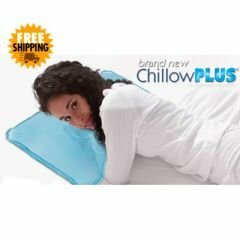 The Chillow Pillow is a water pillow that is filled with a foam or gel. You add water to the port and the cool pillow will help to pull the heat away from your head. You can either use it alone or with your favorite pillow. I’m going to buy one to see if it helps.